Mushroom Mania is back again for its 2014 round. Being in its 14th year, the month-long campaign has attracted a lot of attentions in the public, in media and has been widely discussed on all social media platforms. Mushroom Mania, run by Australian Mushroom Growers, is hosted across all states in Australia with a simple aim to encourage diners to enjoy mushroom dishes while going out for dinner so every one can talk, share and indulge some of the best mushroom dishes that chefs have created. The campaign has evolved gradually over the past 13 years and in this year in particular, with the use of smart phones, social media is the main focus. My experience at Nature’s Providore has already illustrated how excited Adelaide is on Mushroom Mania 2014. If you are a fan of mushroom like me, you may want to join the competition of Mushroom Mania. Simply post a photo with the name of the establishment and your state on social media (Facebook, twitter and Instagram) and tag #Mushroommania2014 to enter to win a $100 prepaid gift card every day for 30 days in July. When thinking about mushroom dishes, many people may say that they are good breakfast dishes or pub dishes, but they can be a little finer as well. Below is a dish I had recently in one of Adelaide’s most famous fine dinning restaurants, Lenzerhide to showcase how mushroom can be a part of a fine dish. This is arguably the best venison dish I have ever had. Although the main focus in the dish was not mushrooms, it did composed of three types of the fungi. The venison meat was served medium rare with a good pinkness in the center of the meat. The flavour was awesome and diners can easily find the infused sweetness from soy sauce as well as a hint of bitterness from the cabernet. The glaze was slightly sweet overall and complemented the meat in a way that promoted the natural flavours of the venison. No game tastes were detected while the mustard also added extra flavours into the dish. The sweet potato chips was crispy on presentation but became soft once in the glaze. In both states, the chips went well with the rest of the dish. The three mushrooms were added with different purposes. The button mushroom was clean on the palate and so it neutralised the slight bitterness well. 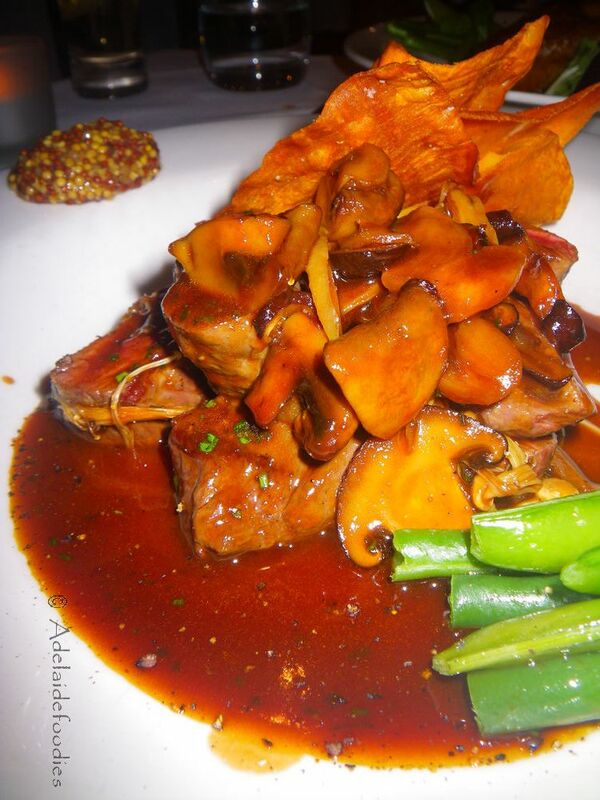 The shitake mushrooms are known for its delicious flavour and the meaty texture, both of which supported the venison taste and enhanced the dinning experience. The earthy tastes of enoki mushrooms also contributed to the complex flavours of the dish. The three mushrooms helped to bring all flavours of the dish together and hence not one single ingredients were standing along in the dish. Well done! 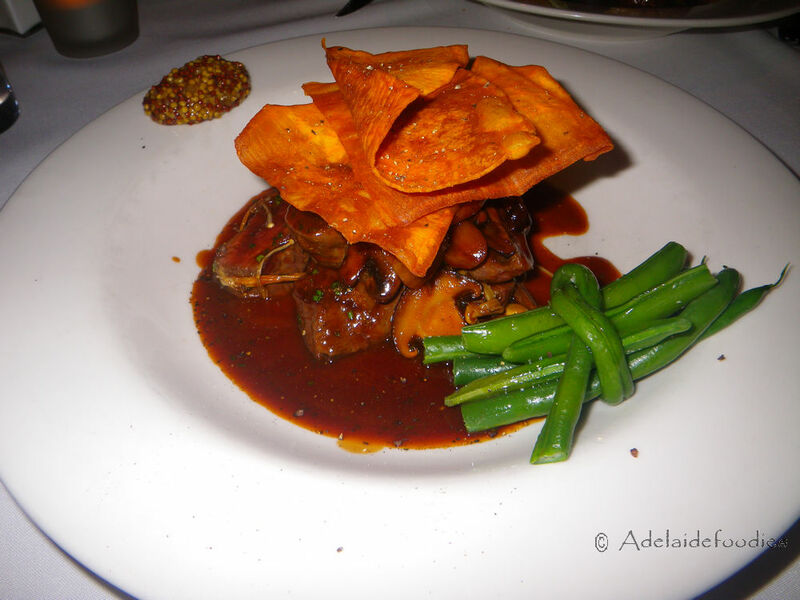 This is a good example of how mushrooms can be incorporated into fine dining dishes. While we were at the restaurant, we also sampled some of their other dishes. 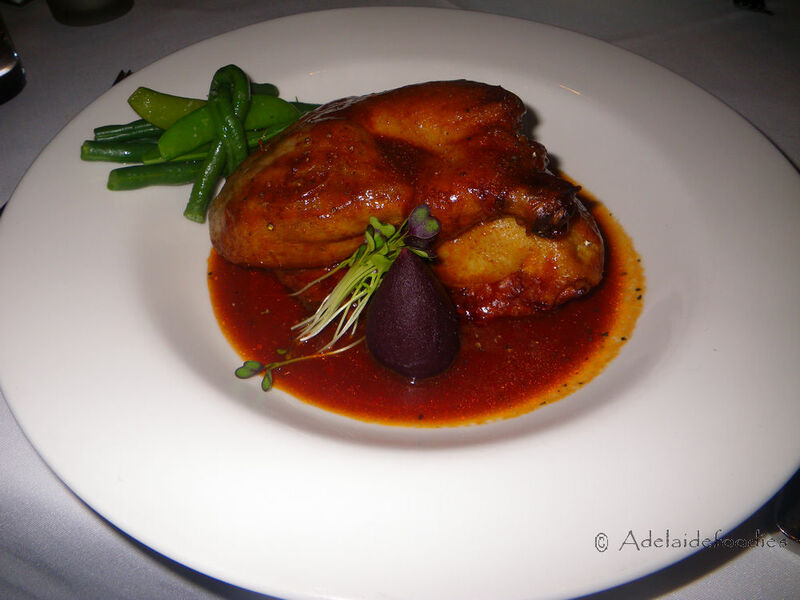 Lenzerhide has been around since 1989 and has been classified as one of Adelaide’s best fine dinning restaurants. 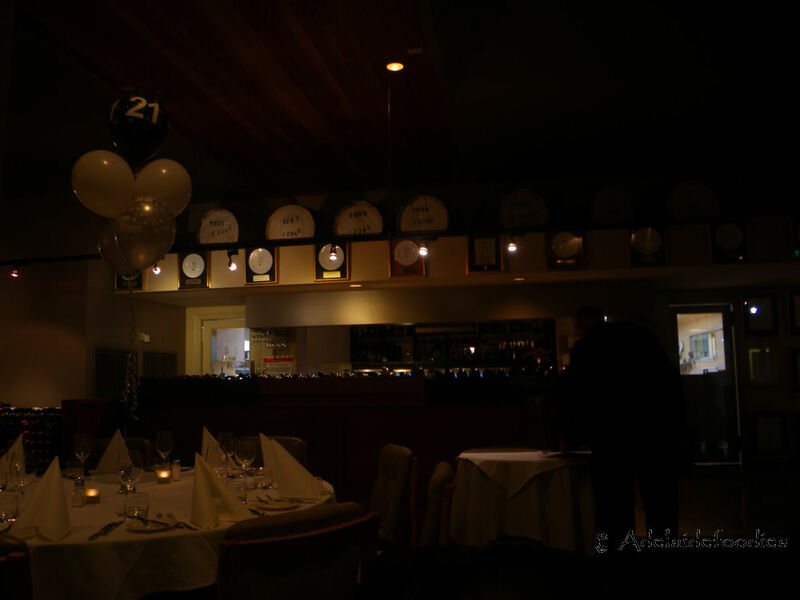 Tucked away in its private block on Unley road, the swiss restaurant has won numerous amoung of awards with high quality services. As indicated previously, the service at Lenzerhide was spotless with no fault and throughout the night, we had good conversations with our waiters. 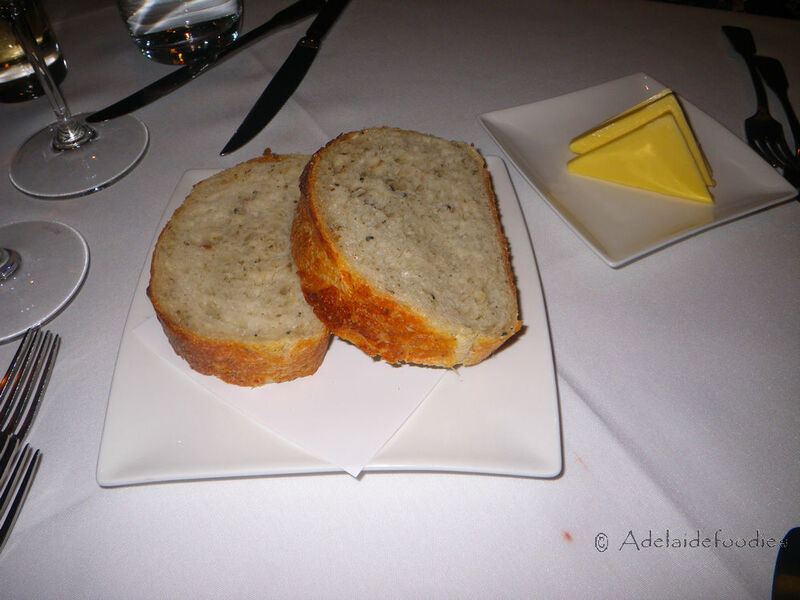 Before the entrees came, we were treated with complementary bread slices – crusty on the outside, extremely on the inside. We ordered two cold entrees, both of which were typical Swiss cuisine dishes. This was a beautifully crafted dish and made this visual impression upon presentation. The air-dried beef slices were wrapped into a flower shape and with the rest of the dish, it just looked great! 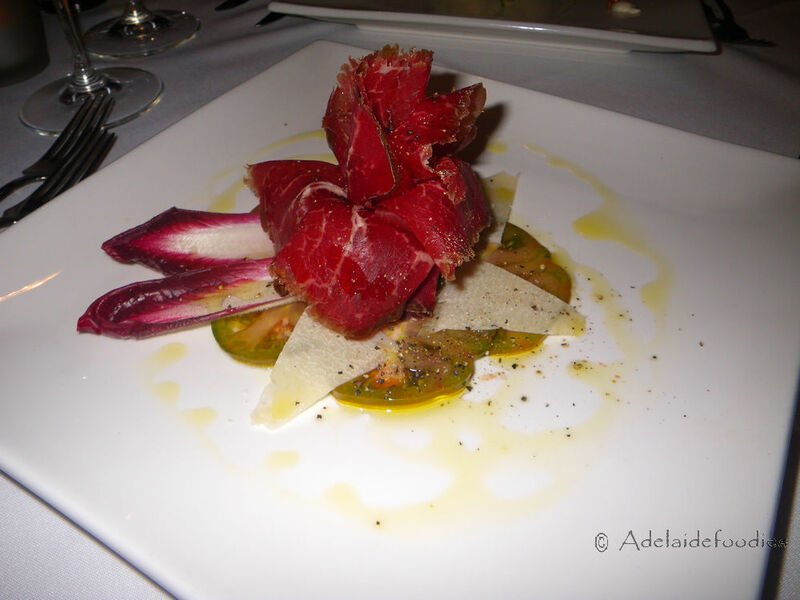 Taste-wise, the air-dried beef had strong and pleasant flavours developed from maturation. The beef was already good to be consumed on its own but once wrapping in the witlof, the tomato and parmesan, the flavours joined together with no spaces in between, making the dish and dining experience extremely enjoyable. Highly recommended! For Tina, she ordered a smoked salmon entree dish. 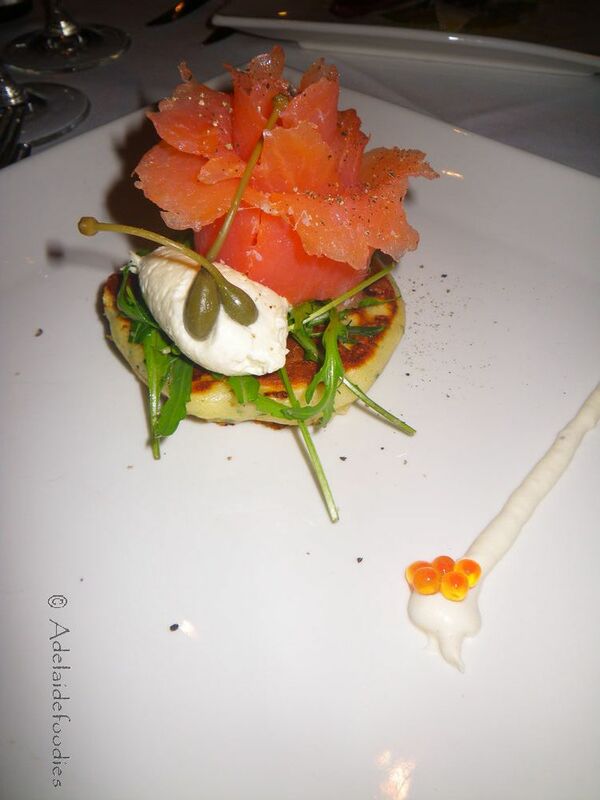 Tasmanian Huon smoked salmon, $21 – herbed pikelet, wild rocket and horseradish cream. Again, with a flower shaped presentation, the smoked salmon dish made us visually impressed. On the palate, the salmon was soft in texture and was easy to bite and chew. The smoky flavours of the salmon fully exhibits in the mouth but with the herbed pikelet, the taste sensation has been brought to a completely higher level. What we did was that we cut a small piece of the pikelet and dip it in the horseradish cream, followed by wrapping in a piece of the smoked salmon. The experience was wonderful and all flavours started to explode soon after entering the mouth. Well done! For mains, we ordered the venison as described previously and a half duckling. This is half of a duckling and it should be enough even for a big man. On the way the duck came to us, strong aromas were fulfilling the area. The duck was cooked twice to perfection. It was extremely tender and was able to be off the bone with an easy touch. The meat was very flavoursome and literally melt in the mouth easily. The pear made a good complement to the duck flavours and the glaze contributed sweetness to the dish. Gradually as you enjoy the duck, the glaze was sucked into the meat and it was then like tasting an American styled BBQ meat as there were plenty of glaze and caramelisation flavours in the meat now :D.
So, foodies, if you are after a mushroom treat for yourself, why not head out and enjoy some fantastic dishes using South Australian produce?! 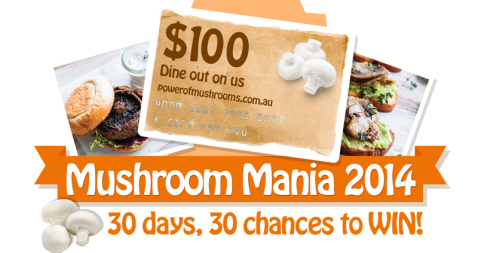 Just remember to #Mushroommania2014 #SA #Establishment to enter the competition to win 1 of the 30 AUD$100 prepaid visa card. For full details on participating in the campaign, visit the Power of Mushrooms. Coming up on Adelaidefoodies is my recent food adventure with a suburban Indian restaurant. 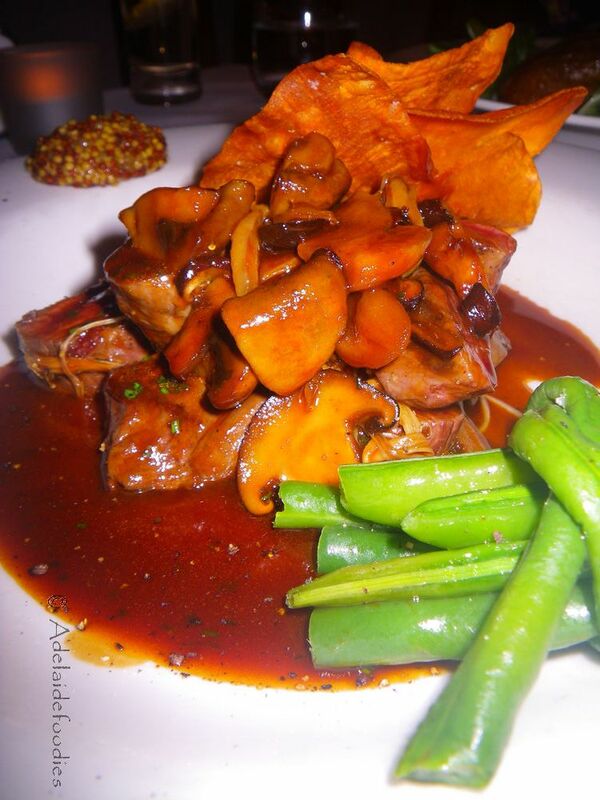 The mushroom + venison dish looks divine! I am planning to there next week. I participated last year and it was such a fun thing to do. The best aspect was that I won a $50 card which paid towards my kids’ clothing etc. I will definitely participate this year. Did you enter last year?! I missed out on that. G’day! I love cooking and baking with all sorts of mushrooms Xin and the venison looks delicious! I am really in love with mushrooms too, both eating and cooking 🙂 They are quite descent in flavours.